We now have a bulletin board in the Boardroom for postings for members helping members. If there is something you need done, or if their is something you can do. These can both be posted on the board. All postings must be brought to the office in order to be posted. The Centre assumes no responsibility in relation to any ads that are posted. It is the responsibility of members to contact one another to arrange the work needed, or offered. Ads to be no larger than 3" x 5". On snow days like this you need to make sure that your direct vent furnace has air to breathe. If your furnace vents out the side of your house you need to clear away any snow that may be drifting up around the intake or exhaust vents. If your furnace stops please take some household tools out with you to check the vents. You will need a screw driver, flash light, wooden spoon with a long handle and a table spoon. Hopefully you now will get heat. Carbon monoxide is invisible, silent, and deadly. Don’t take chances. Have a CO alarm installed in your home today. Every year, Canadians die or are seriously injured by carbon monoxide poisoning. Chances are there is something in your home that could pose a carbon monoxide threat. Carbon monoxide is found in propane, natural gas, wood, heating oil, gasoline and many other substances commonly found in homes. 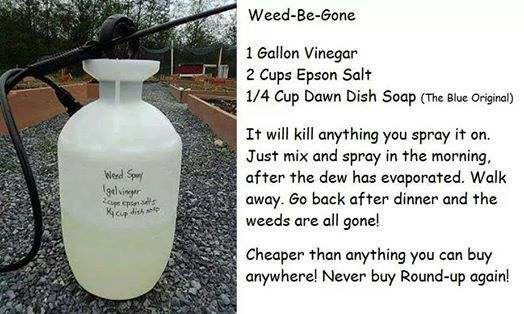 Weed Be Gone - It works!